13. WHAT KIND OF FOOL AM I? 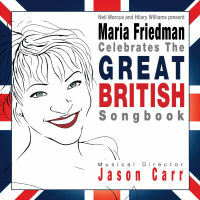 Sepia Records is proud to present MARIA FRIEDMAN CELEBRATES THE GREAT BRITISH SONGBOOK, an all-new studio recording based on the renowned British artist's concert series of the same name at London's Shaw Theatre in 2009. This 15-track CD runs the whole gamut of the British songbook, ranging from classics by The Beatles to Noel Coward's �Mad About the Boy'. The disc is Friedman's first completely new solo studio album in over a decade and represents one of her most personal projects. The programme was hand-picked by Friedman in close collaboration with Jason Carr, the Tony-nominated orchestrator who served as Musical Director and Arranger for both the live concerts and this album. The range of songs is typical of Friedman's versatility. The selections include �Dido's Lament' from Purcell's opera Dido and Aeneas; a salute to the �songs that won the war' with numbers such as �It's a Long Way to Tipperary' and �We'll Meet Again'; and Gilbert O'Sullivan's emotive �Alone Again (Naturally)'. Nevertheless, given Friedman's prowess as one of the West End's great leading ladies, the emphasis is on songs from the stage. Classics such as �If I Ruled the World' from Pickwick and �I Sit in the Sun' from Salad Days are complemented by Andrew Lloyd Webber's �As If We Never Said Goodbye' from Sunset Boulevard and �A Garden' by Musical Director Jason Carr.